My alma mater, the Maryland Institute College of Art, had this ingenious institution called the “midnight breakfast.” It happened just once a semester during finals. As I’m sure you have gleaned from the name, the midnight breakfast was an event that took place in the cafeteria at midnight. It was free (which was good because I didn’t have a meal plan after my sophomore year), it was TONS of fun to get there an hour early and stand in line with your friends, and, best of all, they had french toast sticks. This may sound minor to you, but at MICA, good food served in the dining hall was a rarity. The two things they served that were consistently delicious were chicken tenders and french toast sticks. And, of course, they rarely ever served either of those things. So, once a semester, you would wait in line (in your pajamas) next to people who had been up for days and were covered in charcoal or oil paint or smelled like fixer, and you would be rewarded with french toast stick heaven. The thing about Parkhurst (the company that provides food to starving MICA students via an overpriced meal plan), is that they’re very into making all their food from scratch. Which I would applaud, if most of the time it didn’t taste like… nothing. Apparently they’re also very against seasoning. It’s a nice idea though, especially because I am a big advocate of completely homemade cooking. 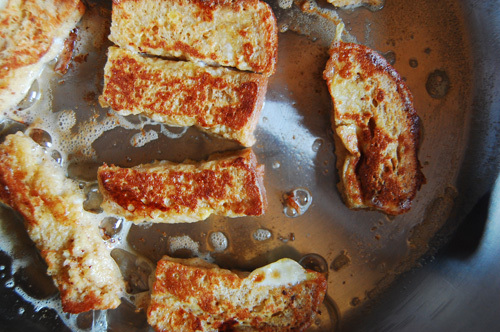 But these french toast sticks, made from scratch, are mind bogglingly good. I think that they’ve been breaded and deep fried and coated and mmmmmmm. This morning what I was really craving was french toast sticks. To be frank, I wanted french toast sticks made from the chili cheddar bread we buy at the Farmer’s Market each week. But, alas, delicious bread we buy Sunday does not usually make it until the following Saturday. 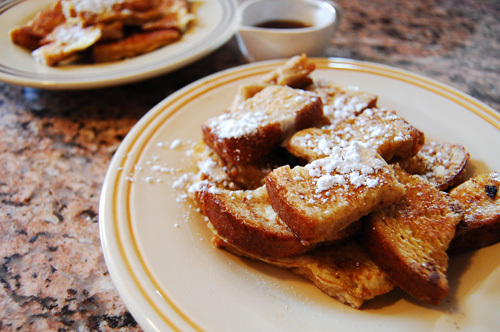 So, I made french toast sticks with wheat toast, which were completely delicious. Maybe one day this week we’ll have brinner, so I will be afforded the opportunity to make chili cheese french toast before the loaf disappears. Whisk together eggs, milk, vanilla, cinnamon, and regular sugar. 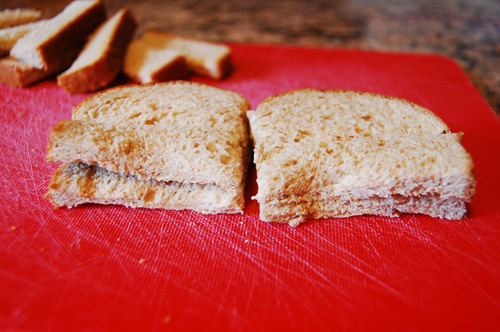 Cut your bread into strips. I like to leave the crust on, you don’t have to. 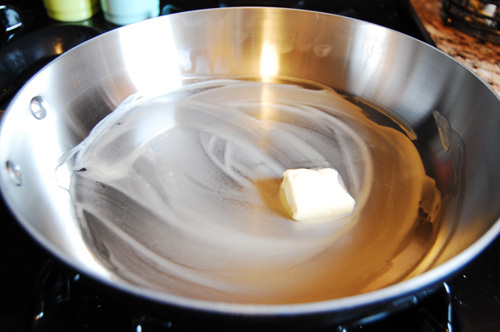 Melt your butter in a fry pan over medium heat. 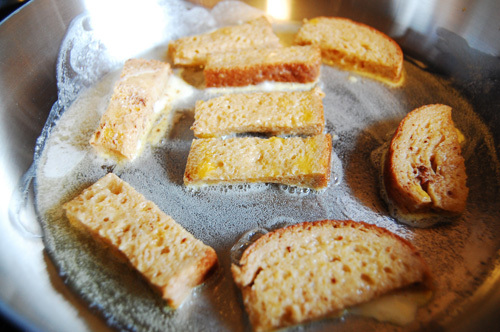 Dip your bread sticks in the egg mixture, making sure each side gets totally dunked. Fry for about two minutes on each side. I like a nice crispy egg edge on my french toast so I allow some of the mixture to slop on over to the pan with my bread. Sprinkle with powdered sugar and pour maple syrup on top. Serve. My wife and I made these this past weekend. Delicious! I think we have found our new Sunday breakfast dish. Thanks for the recipe! No, but you’re welcome to link to it.